Today, April 13 is the anniversary of the Rangers’ 1940 Stanley Cup win over the Toronto Maple Leafs 4 games to 2. New Yorkers are ready for another clincher. In Game 1 of the Stanley Cup playoffs, the New York Rangers showcased the talent that made them Eastern Conference Champions. Armed with Captain Callahan at helm, the Rangers closed in on the win after allowing a 4-0 lead to slip away. The Rangers have learned how to win games with a 21-3-3 when leading after the first period and 30-0-3 when leading after the second. With top-notch goaltending, physical play and a defensive crew limiting the Ottawa Senators and star defenseman Erik Karlsson, New York’s playoff run looks promising. New York has only made it past the first round twice, and hasn’t won a playoff series since 2008. Ruslan Fedotenko has appeared in the playoffs nine times. His veteran leadership, having the most postseason games of any current Ranger, will mimic the passion Coach Tortorella has displayed. Fedotenko has played for four different teams and in a total of 88 postseason games. He has won the Cup twice — with the Lightning in 2004 and the Penguins in 2009. What makes his presence even greater was he played for Tortorella’s Tampa Bay team in the 2004 Finals. 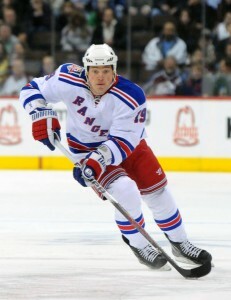 Brad Richards wants to win this, because he’s done it and knows how to get it. Since coming to New York, Richards has embraced the Bluehirts as brothers and the city as home. Richards also played on that Tampa Bay 2004 Cup team with Fedotenko, winning the Conn Smythe as playoff MVP. He’s appeared in 63 postseason games with Tampa Bay and Dallas. He has already made some noise in Game 1 with a goal and 19:21 of ice time. Bringing him to New York on a nine-year, $60 million contract was an investment in building a playoff team, and it seems to be working. The Rangers top-line of Richards, Marian Gaborik and Carl Hagelin has valuable experience beyond Richards’ Stanley Cup ring. Gaborik and Hagelin have had previous pressures in other arenas. Marian Gaborik has played in 34 postseason games, including five with the Rangers last season. In 2003, he played in the Western Conference Finals, in which his Minnesota Wild team was swept by the Mighty Ducks. Though he’s listed as one of the Rangers who have never played in a postseason game, Carl Hagelin has exceptional skills and emerged as a Ranger as soon as his skates hit the ice. Promoted to the top line, Hagelin has shown he can handle the pressure of playing at Madison Square Garden and now entering the Stanley Cup Playoffs. Considered as a steal, Hagelin was selected by the Rangers in the 6th round of the 2007 NHL Entry Draft. Hagelin has international experience as a member of Sweden’s 2008 World Junior Championship team, winning a silver medal. But it’s his experience in front of over 100,000 hockey fans at the Big Chill at the Big House that may help Hagelin during the playoffs. New York will make it past the first-round with confidence. Determined and diverse with talent, this Rangers team is as ready and willing to go deep to win. The Rangers will host the Senators Saturday night before heading to Ottawa for Games 3 and 4.